The Dittmar Family takes great pride in sustainable agricultural practices since we have been farming starting in 1854. 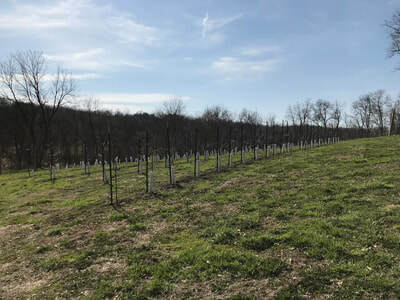 Our “regular” farming methods for traditional farming include practices such as crop rotation, no till planting, contour strips and using the Federal CRP program for Floodplains and Highly Erodible Land. 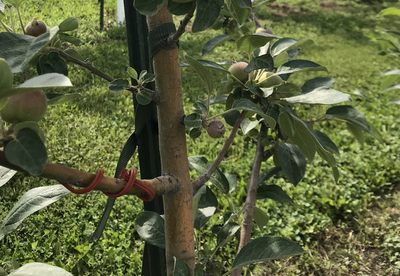 The way we take care of our apples, is no different! Our goal is to grow high quality food that would be safe and that we would be proud to feed our own family. And of course, taste amazing! We do this by practicing Integrated Pest Management. Simply put, we trap bugs in our orchard to see what is in there. Then, we only take action if needed. Commercial growers will spray apples on a calendar schedule, no matter what. We don’t do that! We also follow weather patterns and calendar dates to be prepared and proactive for issues instead of reactive. This helps us grow a great apple using less applications making it better for you and cheaper for us! 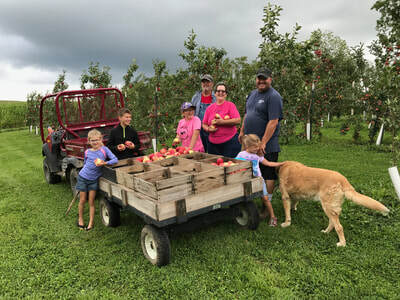 If you take our apple tour, don’t forget to ask us how we do IPM! Do you like honey! Honey has been produced on our farm for the last 50 years! Honey bees are important to the apple growing process and we do our best to take care of them. We also have the BEST honey! Have you ever heard of the “worm” in the apple? It is actually not a worm but the larva stage of the coddler moth. 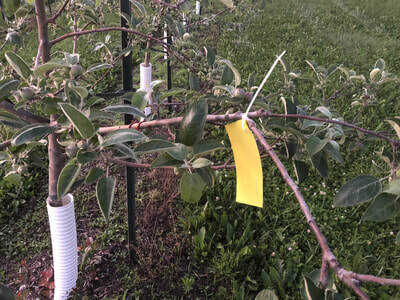 One of the coolest things we use is a pheromone twisty thing that we put around our orchard. This is a mating disruption for the moth and because of it, no spray application is needed. Another cool thing we do is apple maggot traps. Apple maggots are attracted to the red of the apple. 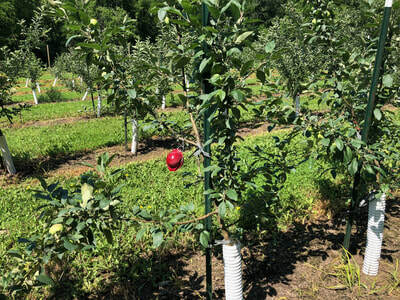 About 2 weeks before the apples turn red, we put fake sticky apples in the orchards. This drastically reduces the need for chemical application and works very well! All in all, by following IPM, we can cut our applications down by almost half! Unlike commercial applications for apples that you buy in the store, using IPM helps us make a safer, sweeter and better tasting apple for you and your family! And ours! Coming Soon - Blondee, Fuji, Royal Red Honeycrisp, Ruby Mac, Sansa, Cortland, JonaStar and pumpkins! Coming soon - Evercrisp, and more pumpkins!